B.S. Chemistry, University of Oregon, 1986 Ph.D. Biology, University of Utah, 1991. At Oregon since 2000. AAAS Fellow (2017). Professional Development, Gallup-Certified Strengths Coach, 2017 (Certificate). 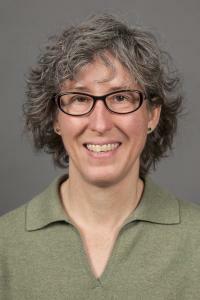 Dr. Julie Haack is the assistant department head and a senior instructor for the Department of Chemistry and Biochemistry at the University of Oregon. As an educator and administrator her work focuses on designing curricula and creating educational experiences and professional development opportunities that use green chemistry and life cycle thinking to connect design and innovation to the science of sustainability. She recetly received the University of Oregon 2018 Sustainability Award for Excellence in Teaching. The award recognizes faculty for the creative integration of principles of environmental, social, and economic sustainability through innovative curriculum design and instruction and for teaching and mentorship that inspires student engagement in sustainability projects on campus or beyond. She currently serves as a member of the leadership team for the Tyler Invention Greenhouse. The greenhouse is an open and collaborative "think tank" environment that grew out of the University of Oregon's Green Product Design Network (GPDN). The GPDN started as a small group of faculty leaders with expertise in green chemistry, product design, architecture, business, and journalism and communication with an interest in inventing sustainable products that can be readily adopted. The goal is to accelerate the movement of ideas from invention to the marketplace in a way that drives innovation. Spreading Sustainability: How Science-Based Solutions Move to Broad Practice is a collaborative research project with Andrew Nelson and Jennifer Howard-Grenville from the UO Business School. This project was initiated in 2009 to use the emergence, development, and successful diffusion of green chemistry as a case study to identify mechanisms by which innovative science-based approaches spread within and beyond academia and gain legitimacy among diverse audiences. Jennifer Howard-Grenville, Andrew J. Nelson, Andrew G. Earle, Julie A. Haack, Douglas M. Young. “If Chemists Don’t Do It, Who Is Going To?” Peer-driven Occupational Change and the Emergence of Green Chemistry, Administrative Science Quarterly, First Published January 19, 2017. Available on-line through January 2017. Nelson, A.; Earle, A.; Howard-Grenville, J.; Haack, J.A. ; Young, D. Do Innovation Measures Actually Measure Innovation? Obliteration, Symbolic Adoption, and Other Finicky Challenges in Tracking Innovation Diffusion, Research Policy, 2014. 43 (6): p. 927-940. As a tenured senior instructor Haack’s courses (see examples below) engage students in the study of chemistry by incorporating green chemistry and life cycle thinking into the curriculum. Green chemistry is the design of chemical products and processes that reduce or eliminate the use and generation of hazardous substances. Often referred to as a form of molecular-level pollution prevention, green chemistry relies on a set of principles that can be used to design or re-design molecules, materials and chemical transformations to be safer for human health and the environment. The incorporation of green chemistry principles into the curriculum provides new opportunities to enhance the curriculum and engage a broad spectrum of students in the study of chemistry. The proactive approach that green chemistry takes appeals to students because many of them care deeply about their environment and are looking for a way to make a difference in society. Although many faculty and students recognize the benefits of a greener curriculum, widespread incorporation has been limited by the availability of educational materials and the scarcity of successful models for integrating green chemistry into the classroom and laboratory. Dr. Haack is actively involved in the identification, development and dissemination of educational materials in the area of green chemistry and designing tools and workshops that facilitate the development of a green chemistry education community. GEMs is a living database of educational materials Haack designed to facilitate the identification, development and dissemination of laboratory exercises, lecture materials, course syllabi and multimedia content that illustrate chemical concepts important for green chemistry. Each item in the collection has an overview page that includes a summary of the item and its connection to green chemistry. The collection is searchable by a variety of parameters, including chemistry concepts, laboratory techniques, green chemistry principles, and target audience. We believe that collaborative efforts to expand the database content are critical for successful adoption of the database as an effective resource. Dr. Haack is also the coordinator of a growing network of educators, Green Chemistry Education Network who teach green chemistry and who are working to develop educational materials for green chemistry. This project compliments efforts by the American Chemical Society’s Green Chemistry Institute and the Environmental Protection Agency to make green chemistry educational materials more accessible to chemical educators. In addition, we hope that the database will catalyze the formation of a green chemistry education community not limited by traditional chemistry disciplines or institutional setting. Haack, J.A. and Hutchison, J.E. Green Chemistry Education: 25 Years of Progress and 25 Years Ahead, ACS Sustainable Chemistry & Engineering, 2016. (4) 11: p 5889–5896. The Challenge: Color dramatically influences human behavior from how we communicate to how we make decisions and is a ubiquitous component of consumer products. The materials and processes used to generate color in consumer products have significant impacts on human health and the environment. In light of the economic, social and environmental impacts of color on society, students will use the principles of green chemistry to design a comprehensive strategy for overcoming the challenges associated with dyes and pigments. The strategy should be economically viable, socially acceptable and have a net positive environmental impact compared to existing products/processes. During the workshop we will provide background information about the history, chemistry, impacts, and business of color and will describe how to use a variety of tools to address the unintended biological impacts of dyes and colorants. Throughout the day student teams will have opportunities to brainstorm ideas, test drive possible solutions amongst their peers, and then present their final ideas to the group at the end of the day. HOPES is an annual sustainability conference hosted by the University of Oregon’s School of Architecture & Allied Arts. It’s also the first and one of the only student-run sustainability conferences in the United States! The student challenge: Color dramatically influences human behavior from how we communicate to how we make decisions and is a ubiquitous component of consumer products. The materials and processes used to generate color in consumer products have significant impacts on human health and the environment. In light of the economic, social and environmental impacts of color on society, students attending this year’s workshop designed strategies for overcoming the challenges associated with dyes and pigments. Workshop Green Materials (CH 610) - Part of the UO Sports Product Management graduate degree, green materials in product innovation provides students with a materials science foundation that (1) empowers them to lead efforts to select, compare, specify and influence the design of greener materials, (2) facilitates innovation at the nexus of product performance, business and sustainability today and beyond, and (3) enables students to communicate the value proposition for greener materials to diverse audiences. Chemistry of Sustainability (CH 113 – large enrollment) is the result of a collaborative process with five other faculty, to design an introductory chemistry course that uses chemistry as a tool to explore grand challenges in sustainability. Haack, J.A., Berglund, J.A., Hutchison, J.E., Johnson, D. W., Lonergan, M.C., Tyler, D.R. “Chemistry of sustainability:” A general education science course enhancing students, faculty and institutional programming. Conferences on Chemistry “Educating the Next Generation: Green and Sustainable Chemistry,” J. Chem. Educ., 2013. 90 (4): p. 515-516. Green Product Design (CH 114- large enrollment) focuses on integrating green chemistry with product design, journalism and communications, and sustainable business practices to illustrate the central role chemists play in developing the more sustainable consumer products. The target audience for this course is students from the professional schools on camps. Molecular Innovation in Material Life Cycles (ARCH 4/507, spring 2013) Working with architecture faculty member Erin Moore, students in this course explore the impacts of building materials across their life cycles from natural resource extraction, to material processing, to product use and material end-of-life or re-use. Science of Design (PD 199) Working with product design faculty member, Kiersten Muenchinger, students in this course use green chemistry to explore innovative ways to design greener athletic shoes. Chemistry of Skiing (CH 199) Working with chemistry faculty member Jim Hutchison, students in this course explore the role of chemistry in designing materials used to manufacture high performance outdoor clothing, skis and snowboards. Haack began her own career in science at the UO, graduating with a B.S. in chemistry in 1986. She received her Ph.D. in biology at the University of Utah, followed by a postdoc in pharmacology at the University of North Carolina at Chapel Hill. After returning to UO as an Adjunct Assistant Professor and Faculty Fellow in chemistry, she worked with Rick Dahlquist and Carlos Bustamante as a Howard Hughes Research Associate. Before returning to the University as the Assistant Department Head for chemistry, Haack worked as the Director of Research for Emerald Diagnostics, a Eugene start-up company specializing in fine particle and diagnostic technology development and as the Director of Product Development and Design for Nutri-Logics, Inc., a biotech start-up company dedicated to designing nutritional supplements for cancer prevention. She was responsible for coordinating research to develop dietary supplements that could reduce an individual’s risk for cancer. CH 610 Green Materials in Product Innovation l Winter 2019 l UO Sports Product Management Program l Portland, Oregon. Sustainable Invention Immersion Week | Tyler Invention Greenhouse | 942 Olive, Eugene, Oregon. Co-Chair with Professor Richard Blackburn for the 22nd Annual Green Chemistry & Engineering Conference | June 18-20, 2018 | Portland, Oregon.